Despite finishing tied for 57th at Oak Hill on seven over, the Offaly star reckons he’s easily good enough to make the world’s Top-50 and battle for a Ryder Cup place next year. “My game is very close to being very, very good,” Lowry said. “I think 90 per cent of it is good and I have to work on that other 10 per cent. “I really feel like I can push towards another win in the next few months and that will hopefully cement my place in the Top-50 in the world for the end of the year. 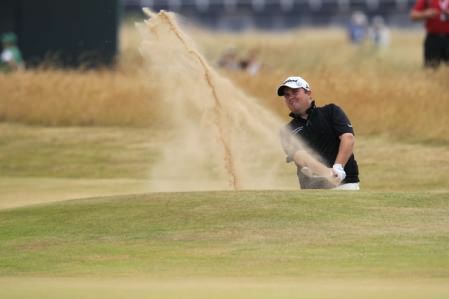 Shane Lowry three-putted the 15th for a double bogey that took the wind out of his sails in the final round. Picture: Eoin Clarke www.golffile.ie“I am not blowing my own trumpet here or anything but there are not many players in that Top-50 in the world I feel like are better than me. 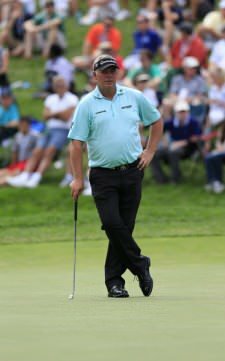 Lowry had five birdies in his final round but was left to lament four bogeys and a careless, three-putt double bogey from just 10 feet at the 15th. He almost chipped in at the last to win a bet with his caddie Dermot Byrne and a free holiday for holing out 11 times from off the green this season. After being forced to wait on Tiger Woods at one stage in his round, it dawned on him that he’s keeping some serious company these days. Lowry said: “I was on 12 and Tiger was putting out on four and I said to Dermot we’d better wait. It was pretty cool to be waiting for Tiger to hit a shot. “I still think he is God and it is great to be playing in the same tournaments as him and competing against him. Racking up some big money will be key for Lowry’s Top 50 bid and his Ryder Cup hopes with the Johnnie Walker Championship at Gleneagles his next start. He said: “I’d love to do it by Christmas, if I don’t do it, it’s not the end of the world is it but it is very important for Ryder Cup. “That’s one of the main goals for next year, to give myself half a chance you have to be in the top 50 and playing in all the big tournaments and finishing well to make that team. But he knows that he’s not far away from taking a huge step up with his career. Reflecting on final round, he said: “It was a bit of a rollercoaster, played good and obviously the double on 15 stopped me in my tracks. Darren Clarke shot his worst round in 15 US PGA appearances on Sunday - a 10 over 80. Picture: Eoin Clarke www.golffile.ie“To have five birdies on that golf course, set up tough, the Sunday of a Major, I could have shot under par easy enough. With Rory McIlroy set to skip the World Cup, Lowry and Harrington could be battling for a place alongside Graeme McDowell at Royal Melbourne in November. The cut off for qualification falls on September 23 and Lowry is already ahead of the Dubliner in the pecking order. Lowry’s playing partner Darren Clarke was in no mood to chat after crashing to his worst ever US PGA performance. The Ulsterman ballooned to a 10 over 80 to finish 75th and dead last of the players who made the cut on 16 over. A disconsolate looking Darren Clarke. Picture: Eoin Clarke www.golffile.ieIt was a bitterly disappointing day for the 2011 Open champion, just three days before his 45th birthday and he immediately headed for his car with his wife and family in tow. He hit eight of 14 fairways in the final round but missed 10 greens and had 34 putts. After a birdie three at the second, he fluffed a chip at the third and doube bogeyed before dropping another shot at the long fourth after bunkering his third. After three putts at the 10th, he failed to get up and down for par at the 11th and then duffed his approach to the 12th to go six over for the day. After carving a hybrid against a grandstand at the 14th and missing from six feet for par, he drove into more trees at the 16th to slip to eight over. He looked good to break 80 but drove onto the downslope of a bunker at the 18th, hacked his recovery just over the sand into the heavy rough above the bunker, chipped out and eventually closed with a double bogey six. 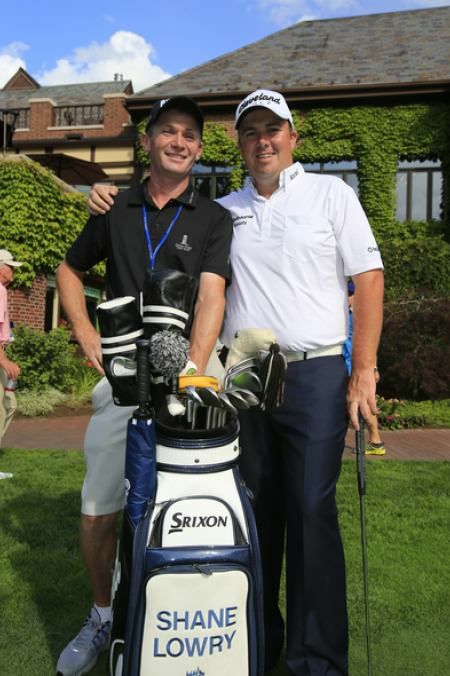 Shane Lowry and caddy Dermot Byrne in front of the Oak Hill clubhouse. Picture: Eoin Clarke www.golffile.ieShane Lowry almost chips in from the back of ninth at Oak Hill and a wide smile spreads across his face. His caddie, Dermot Byrne, smiles too. 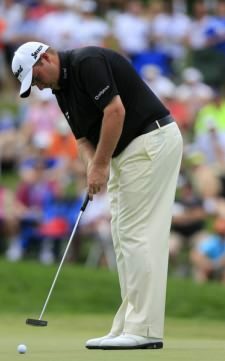 Shane Lowry putts on the 10th at Oak Hill. Picture: Eoin Clarke www.golffile.ieShane Lowry was frustrated not to turn it on for massive crowds in the US PGA but a good finish could still give him a chance of more big time golf this season - at the Seve Trophy.